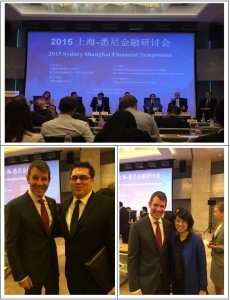 HLK Group was proud to attend the fourth annual Sydney-Shanghai Finance Symposium being facilitated by the Shanghai Municipal Financial Services Office on 6th Nov 2015 in China Financial Information Center building located in Luijiazui. Representing HLK Group at the Symposium was Jason Holdsworth (Director) and Moya Gu (Group Strategy Manager – Asia). The Honorable Mike Baird MP, Premier of NSW made a keynote speech for the opening of the Symposium. He emphasized that The NSW Government is committed to helping Sydney continue to grow by attracting and supporting new and expanded investment in the financial services sector. The government is also working closely with Shanghai to establish innovative and leading world class financial services business. Financial service sector is the largest industry in NSW, currently contributing $60Billion to the State Economy in 2013- 2014. The delegation of senior finance representatives from both countries actively discussed the topic of Cross-border usage of the RMB currency. Deputy General of Cross-border RMB Business Department, PBOC Shanghai Head Office confirmed the further development of RMB Internationalization as a key objective of the Chinese government. Sydney as a major offshore RMB hub has great potential for growth and internalization of the RMB. Other opportunities include mutual interest to both Australia and China in the asset management industry and utilization of the Free Trade agreement between two countries. The symposium is closed by Mr. Tu Guangshao, Executive Vice Mayor of Shanghai.